NEW YORK, NY--(Marketwired - Oct 8, 2015) - The Madison Square Garden Company and Major Energy today announced a renewed and expanded multi-year marketing partnership, naming the New York-based energy supply company the Official Gas and Electricity Partner of the New York Knicks and New York Rangers, as well as an Official Partner of Madison Square Garden. The agreement provides Major Energy with premier brand integration at The World's Most Famous Arena during Knicks and Rangers games. Major Energy is a licensed energy service company supplying natural gas and electricity to residential, commercial and industrial customers in Connecticut, District of Columbia, Illinois, Massachusetts, Maryland, New Jersey, New York, Ohio and Pennsylvania. 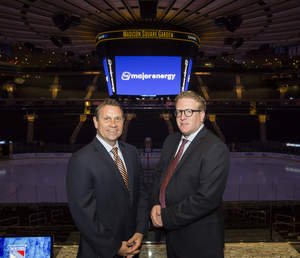 "The Madison Square Garden Company is like no other company in the world, and we're thrilled that Major Energy has seen the value of our partnership and decided to expand its affiliation with their Official Gas and Electricity Partner designation for the New York Rangers," said Ron Skotarczak, executive vice president, marketing partnerships, The Madison Square Garden Company. "We are committed to ensuring that the strength of our legendary brands and the unique reach of our assets benefit our partners in significant and measurable ways -- and we look forward to continuing to work closely with Major Energy on programs and promotions that benefit both of our businesses well into the future." "We broke marketing barriers in the retail energy space back in 2013 by partnering with Madison Square Garden and the New York Knicks, becoming one of the first energy companies to structure a deal of this nature and size," said Eliott Wolbrom, chief marketing officer of Major Energy. "Since then, Major Energy has enjoyed an outstanding relationship with Madison Square Garden and we are extremely pleased to be renewing and broadening our partnership. They are a remarkable, partner-oriented organization. The Madison Square Garden Company and the New York Knicks and New York Rangers are hugely iconic and powerful national brands with tremendously large and passionate fan bases. We look forward to continuing to utilize our marketing partnership to bring the Major Energy brand and value proposition to those fan bases. Supplying power to Madison Square Garden, Radio City Music Hall, the Beacon Theater and the Theater at MSG, coupled with our newly added official and exclusive designations with the New York Rangers, serves as true testament of our commitment and hope of working with Madison Square Garden for years to come." As part of the marketing partnership, Major Energy will enjoy significant brand exposure at The Garden during all Knicks and Rangers games. This will include courtside LED signage throughout the Arena for all Garden events, the "Knicks Noise Meter Presented by Major Energy" and "Rangers Celebrity Welcome" features on GardenVision (the center-hung scoreboard), and the Presenting Partner of the Knicks and Rangers "Moment of the Month," which will be featured on all digital platforms for each team. In addition, Major Energy will receive promotion on Knicks.com and NYRangers.com, as well as their branded webpage at Knicks.com/Major Energy and NYRangers.com/Major Energy. Major Energy will be the presenting partner of the Madison Square Garden "Bridge-to-Business Council," a council of select Madison Square Garden partners geared at facilitating business-to-business with one another, of which Major Energy is a founding partner. Major Energy also will be the presenting partner of the new "Small Business Council," a council focused on promoting business-to-business between Madison Square Garden partners and local small businesses.